Simply Beautiful is offered as an oral supplement that nourishes the body to help you stay young and beautiful. How Does Simply Beautiful Work? You have a beautiful body, and you want to do everything you can to preserve it and stay radiant. It would be easy to do this if you lived in a place with no pollution or skincare products that do more harm than good. Unfortunately for you, you don’t. So, you need something that can help to maintain your natural beauty. 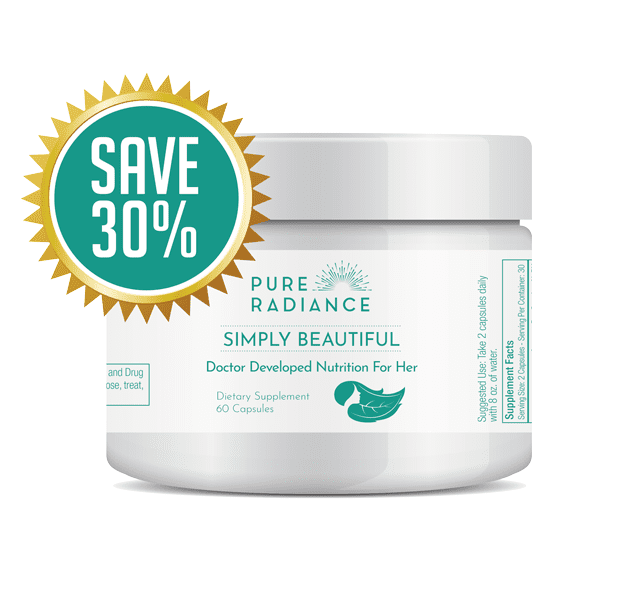 Something like Simply Beautiful from Dr. Al Sears M.D and the team at Pure Radiance. Simply Beautiful is a new kind of beauty product. It is offered as an oral supplement that nourishes the body to help you stay young and beautiful. People commonly use topical creams to treat things like complexion, blemishes, and the like. The problem is that the ingredients in these topical creams, no matter how good, can only partially penetrate the skin and offer their benefits. Simply Beautiful, as an oral supplement, works from the inside out. The power of Pure Radiance Simply Beautiful lies in the high quality, natural, healthy ingredients including acerola cherry, bamboo, biotin, and hibiscus. Let’s take a closer look at these ingredients, and what they can do. Acerola Cherry – Acerola cherry is packed full of vitamin C. It keeps the immune system healthy and has been shown to increase collagen levels in skin. This makes your skin plumper and suppler. Biotin – Biotin can be found in many products for boosting hair strength. Alongside keratin, biotin is necessary to keep hair and nails strong enough to resist breakage. Bamboo – Bamboo is included in the Pure Radiance formula because it contains copious amounts of silica. Silica is used for a number of functions, including strengthening bones, improving nail quality, and helping your body to absorb other nutrients. Hibiscus – Hibiscus offers a range of anti-aging benefits, which is why it too is included in many lotions and skincare remedies. It is known to help reduce the signs of aging, and can possibly help prevent hair from turning gray. Hyaluronic Acid – Hyaluronic acid can be found in a number of skincare remedies. It’s used to improve skin hydration. Hyaluronic acid helps the skin to absorb water and leaves it looking plumper than ever. Vitamin E – Vitamin E is filled with important nutrients. These nutrients help to prevent damage from free radicals, leaving your skin looking better and leaving you with a healthier digestive system in the process. Vitamin A – Vitamin A is important for supporting skin tissue. It is most commonly found in egg yolks, but taking Simply Beautiful you can skip the eggs and just get the benefits of vitamin A for yourself. Simply Beautiful is a great solution for any consumer looking to improve their skin health. You might be wondering why your other skincare products don’t give you the results that you expect. The answer could be that they aren’t able to penetrate the skin properly to provide their benefits. Simply Beautiful supports your body from the inside out, making it simple to be beautiful.